The testimony of Lupe Marshall to a U.S. Senate committee on the 1937 Memorial Day Massacre, a day in which police opened fire on strikers. 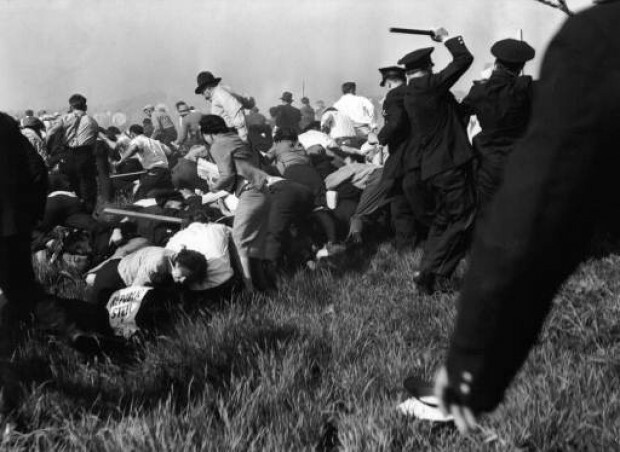 When members of the Steel Workers Organizing Committee (SWOC) decided to strike the “Little Steel”companies in May 1937, they could hardly have expected it to result in a massacre. On the afternoon of Memorial Day, a flag-waving, ethnically diverse group set out for the companyÌs Republic Steel’s main gate but were stopped by a large contingent of policemen. When one of the policemen suddenly and inexplicably fired his revolver into the front of the crowd the march turned into a massacre. In the end, ChicagoÌs police killed ten fleeing workers, wounded thirty more and beat fifty-five so badly they required hospitalization. Lupe Marshall, a housewife and volunteer social worker in South Chicago was among those beaten. She gave this testimony to the U.S. Senate Committee on Education and Labor, known informally as the La Follette Committee for its chair, Senator Robert La Follette, and charged with investigating the incident. Senator LA FOLLETTE: Were you successful in your efforts to get away from the police? Mrs. MARSHALL: No; I was not. After I evaded these policemen that were immediately in front of me . . . . I was aware that my head was bleeding. I noticed that my blouse was all stained with blood, and that sort of brought me to, and I started walking slowly toward the direction from which a policeman had just clubbed an individual, and this individual dragged himself a bit and tried to get up, when the policeman clubbed him again. He did that four times. Senator LA FOLLETTE: When he was on the ground? Mrs. MARSHALL: While he was trying to get up. Every time he tried to get up the policeman’s club came down on him. Then he took him by the foot and turned him over. When the man finally fell so he could not move, the policeman took him by the foot and turned him on his back, and started dragging him. As he turned over, I noticed that the man’s shirt was all blood stained here on the side, so I screamed at the policeman and said, “Don’t do that. Can’t you see he is terribly injured?” And at the moment I said that, somebody struck me from the back again and knocked me down. As I went down somebody kicked me on the side here, a policeman kicked me on the side here. Senator LA FOLLETTE: How can you be sure they were policemen? Mrs. MARSHALL: Well, I could see from the sides. I could not identify the particular policemen that did it, but I could see their uniforms, and I could see the edges, the ends of the clubs from the side of my eyes. Senator LA FOLLETTE: How much do you weigh, Mrs. Marshall? Mrs. MARSHALL: I weigh 92 pounds now. I weighed 97 when this happened. Senator LA FOLLETTE And how tall are you? Mrs. MARSHALL: 4 feet 11. Senator LA FOLLETTE: Go ahead. Then they took me to the other patrol wagon, and that patrol wagon was filled also, so they took me to a distance and at that moment a patrol wagon drove in, or got into position, but it was in motion, and it stopped right in front of us, and they opened the door, and I was going to step in. I had one foot on the step when a policeman put his hand on my back, on my buttocks, and shoved me in there, so that if I had not put my hands across my face I would have struck the grating of the window in the front of the patrol wagon in there. After I poised myself I walked over in the wagon and sat next to the door, and observed out as much as I could. When the policemen started to pick up those men that had been lying approximately where I had been standing when the thing started, they started bringing them in by their feet and their hands, half dragging them and half picking them up, and there was one man that they brought, the first one that they put in the wagon, he was a heavy set fellow. He weighed about 200 pounds, blonde fellow. They grabbed him, and shoved him in the wagon, ...and I noticed that he had two red stains about the size of a penny, one on the upper side of his abdomen and one lower, and immediately after that other policemen started bringing the other wounded men, and that is the confusion in which they threw every one of the men that were in the wagon with me. None of the men that were in the wagon with me were able to sit up. None of them sat on the benches. I had to lift my feet up on to the bench to allow them to put the men in there. Senator LA FOLLETTE: Did they pile them one on top of another. Mrs. MARSHALL: They piled them one on top of the other. There were some men who had their heads underneath others. Some had their arms all twisted up, and their legs twisted up, until they filled the wagon up, and one man said, “Well, I guess that’s all”, and they shut the door. Senator LA FOLLETTE: How many would you say were in the patrol wagon at this time? Mrs. MARSHALL: 16 men—16 men, besides myself. Senator LA FOLLETTE: Were there any others seriously wounded in the wagon? Senator LA FOLLETTE: Just a moment. Had any of them, could you see, received any first aid? Mrs. MARSHALL: No; none of them, because I saw where they were picking them up from. They were picking them up from the original position in which they laid there. They were bringing them into the wagon. Senator LA FOLLETTE: Now tell us about the trip, and where you went. Mrs. MARSHALL:As soon as the wagon started, and they had closed the door, one of the policemen stepped on the step of the wagon and held his hands on it while we were driving. Well, as soon as the wagon started I started helping these men that were in the wagon. I started straightening out their heads and lifting their arms from underneath, and I noticed that there was one particular fellow there who looked very gaunt and haggard, and he seemed to be in a terrible position. There was a heavy-set man that had fallen on top of him, and this fellow was pinned completely with his head over his knees. I straightened him out, managed to get his head on my lap, but when I did that I noticed that his face was getting cold and was black, turning black, and he was motioning to his pocket, his shirt pocket. He had a package of cigarettes there, and I understood he wanted me to light a cigarette for him, but I had no matches, and when I did get the cigarette out it was stained with blood, and it was cloaked with blood, so he said, “Never mind, kid”, he says, “you are all right. You are a good kid.”He says, “Never mind. Carry on.” And he started to say “mother”—but didn’t finish, and he stiffened up and I became somewhat hysterical. I told the patrolman that was in the back of the wagon, I said, “I hope you get the medal for this.” I said, “Your children and your wife must be very proud of you.” And he says, “I didn’t do that”, he says,“I wouldn’t do that. I am just doing here what I can for you now. I am trying to help you as much as I can. That is all I have to do, is to see that you get medical care now”, he says, “But I wouldn’t do that.”And as he said that I noticed the tears rolling down his eyes. Well, it seemed we drove all over the city of Chicago before we got to the hospital. It was ages before we were able to get there, and every time the patrol wagon jolted, these men would go up about a foot or so, and fall on top of each other, and there was the most terrible screaming, groaning, and going on in that wagon! Finally we got to the hospital. I later found out it was Burnside Hospital, and they took me out first, and not very gently either. The policeman that handled me said, “Come on, get in there”, and took us into the dispensary in the basement of this hospital. As soon as I was in there I told the nurse—there was one nurse there—I said, “There are a lot of men coming in”, I said.“They are all seriously wounded.” She says, “Oh, my goodness! We haven’t nurses. We haven’t got doctors on the floor.” Then the policemen started bringing them in, bringing the men in in the same manner in which they had put them in the wagon. They were bringing them by the feet and hands, and laying them on the concrete floor. The reason why I can estimate that there were 16 there is because I counted them, so as to be able to see if I could recognize any of them later on for their families. I really feared that none of those men that were in there were going to live. There were four men put in the X-ray room, in back of the X-ray room, and the man that I am sure died on my lap on the way to the hospital was put there, and there were four men laid out there, and four men were laid inside of the dining room, and were placed on chairs in the dining room, but they just hung limp there. The couldn’t control their position at all. Well, as soon as we got to the hospital—it seemed that immediately after our wagon got there, other wagons came up and other people were coming in. A woman came in with a small child that had been shot in the heel, in the leg, and the doctors seemed to be coming now, and giving attention. I told the doctor I first say, I said,“Please go in there and see if you can do something for this man. I think he is very bad.” He looked at the man and didn’t even touch his pulse. He looked at the man, and he said, “Never mind. You go out in the hall and sit down.” He said, “Take it easy. Sit down and rest.” But when I saw how many wounded men were there, with not enough nurses to take care of them, I went into the dining room. Oh but first I must say that the minute I walked into the dispensary I noticed the telephone in a little office, and I went in there and shut the door and started calling up three telephone numbers that the men that were in the wagon had given me, and I called up my home. I told my brother what had happened, and he said, “Never mind. Do not say anything until your lawyer gets there”, he said. So while I was calling up, a policeman in there was banging on the door, and saying, “Get out!” because the door locked as you shut it. He said, “Get out of there, you (blank).”So when I got out I went into the dining room, and as the table was set for the nurses' supper I pushed aside all I could and gathered the tablecloths and napkins, all that I could, and the pitcher of water, and started helping the men that were wounded, and putting these wet packs on their wounds; when a detective from some place—I imagine it was from downtown, since that was the only place where they had detectives—came in, and made a terrible noise. He screamed at these policemen that were standing at the doorway there. He said, “Who the hell ordered this (such and such) shooting?”He swore at them, and the other fellows started to answer, but the policeman that had been advised to watch me—one policeman had been assigned to watch me—said, “Shut up your mug! They are not all dead yet”—and he went like this (indicating) to me, motioning to me. Every time I made an effort to help the wounded, to light their cigarettes, this policeman would come and set me down, until the doctor went to dress the little boy’s leg. I walked in there and asked him if I could help him. He said, “Yes;” so I was holding the boy’s leg and distracted him, when this policeman came and said, “Come on, you have to come out here and sit down in the hall”, and this doctor was very irritated at this. He said, “You have done enough to these people. Now we are trying to do what we can for them Now please get out of here and stay out.” And then the policeman walked out and left me alone for a while. Senator LA FOLLETTE: How old would you say this child was? They took me upstairs, and the policeman had spoken to a detective, before they took me up there, and the detective had said, “For God’s sake! Get her name.” He said, “We have got to get these names for the records.” Well, on the way up the nurse took me in a wheel wagon. She would not let me walk, and took me on the elevator. The nurse stayed with me until someone called“Nurse!” and she ran out of the bathroom, and the minute the nurse ran out of the bathroom the policeman walked in and grabbed me by the arm and said, “Now, come on. Quit your stalling,”, he said, “Get going”, and started dragging me through the hall, and as we passed the elevator he hesitated. He stopped in front of the elevator, hesitated, and said, “No; I guess you can walk it”, and he ran me down the steps just as fast as he could. PURSUANT TO S. Res. 266 (74th Congress). Source: June 30, July 1 and 2, 1937. (Washington, DC: United States Government Printing Office, 1937): 4945–4957.